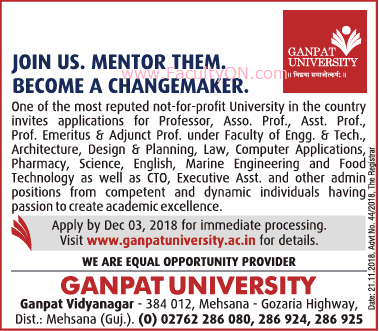 Ganpat University, Mehsana has advertised for recruitment of Teaching Faculty- Professor / Associate Professor / Assistant Professor / Professor Emeritus / Adjunct Faculty Plus Non-Faculty jobs vacancies. Interested and eligible job aspirants are requested to apply on or before 03rd December 2018. Check out further more details below. 1. Applicant shall have to apply through only given specific Registration link for different posts and there is NO NEED to apply by sending e-mail or hard copy. 2. Applicant is required to furnish all asked details and upload filled-in Prescribed Application Form as well as all required documents, which are mentioned in the Registration Form. 3. Prescribed Application Form is uploaded on Ganpat University website. 4. Before submitting registration form, kindly ensure all details and documents are filled and uploaded.